Horizons are a prediction of relativity. The first theoretical example was the idea of a black hole in which the gravity is so strong that light and therefore information cannot escape. So black holes are surrounded by an event horizon, a boundary between what can be seen and what can't: the inside. This horizon has not been seen directly, but the matter spiraling in towards the horizon emits heat due to friction (the accretion disc) and emits radiation, and that has been seen. Another kind of horizon occurs at the edge of the cosmos, since beyond that edge stars are moving away from us at a speed faster than light and so information from them cannot get to us: a cosmic horizon. Lest you think that horizons are difficult to get to, I can assure you that there's no need to take part in a kamikaze mission into a black hole or to travel to the cosmic edge. Horizons are everywhere. If you accelerate to the right, then information from far to your left, limited to the speed of light, can't catch up with you, so a so-called Rindler horizon forms to your left. You can make your own horizon, at home, just by moving your hand. Quantised inertia comes from assuming that this horizon damps the zero point field, making it non-uniform and pulling your hand back against its initial acceleration. 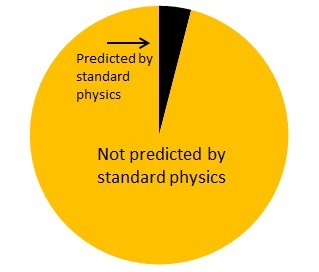 Quantum mechanics (zpf) and relativity (horizons) co-operate here to make quantised inertia which predicts inertial mass and, by the way, the 96% of the cosmos that standard physics cannot (see the orange bit in the pie chart below: an unsubtle way to make the point, but mainstream physics ignores this). A common feature of all these horizons is that they attract. Black holes do by definition, though the evidence for them is not direct. The cosmic horizon also attracts everything towards it. Evidence for that was found by Riess and Perlmutter (1999): the famous cosmic acceleration (quantised inertia shows why). The Rindler horizon pulls you back against any acceleration and in this way, quantised inertia predicts inertial mass. So, the obvious "spread-mankind-thru-the-galaxy" question is, can we make synthetic horizons wherever we want and make spaceships move without fuel? I think so. The first evidence I can mention to back this up is the Casimir effect, which was first demonstrated practically in 1997 by Lamoreaux. Two parallel metal plates act as horizons, damping the zero point field (zpf) between them so there's less zpf pushing out and more zpf outside pushing them together. Energy and movement from what was supposed to be 'nothing'. In my opinion the emdrive is the second example. My evidence for that is that quantised inertia predicts it by assuming that the metal walls of the cavity damp the zero point field more at its narrow end, so the cavity moves that way, almost as if it is moving down a hill. 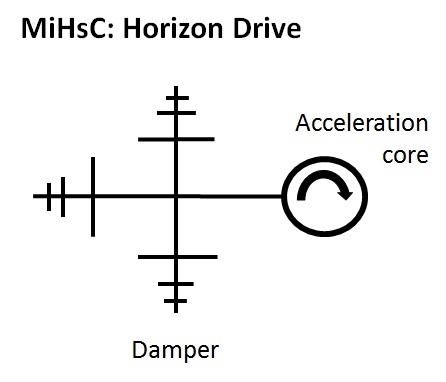 Quantised inertia (QI, MiHsC) predicts the observed thrusts well. The emdrive does this with photons resonating back and forth, but there are many other possible ways to make a hyper-accelerated core: spinning discs, photons in fibre-optic loops (LEMdrive), plasmons propagating round sharp corners, electron jumps at superconducting transitions (Podkletnov, Poher), even sonoluminescence. Practical physicists will know of many more possibilities. You then just need an asymmetrical metal structure of the right size to damp the Unruh field and the core will move anomalously. 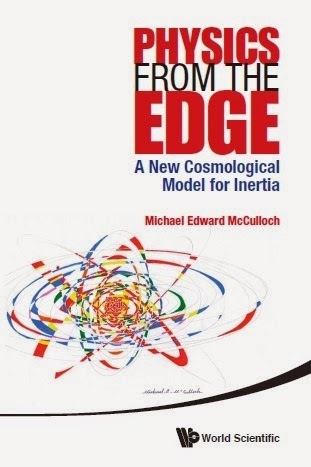 Quantised inertia predicts a entirely new field of horizon engineering. Ultimately it may provide technology like the space-time engineering used to build The Way in Greg Bear's brilliant novel Eon. Nature in my view is not made of old-fashioned waves and particles, but of information and horizons and the evidence is pilling up that this is true (see my papers). Your are still exploring the never-never-land, I see. It is nice to be able to create ones own reality, because then everybody else is wrong. Using L=8C²/a formula and a simple list of accelerating things (https://en.wikipedia.org/wiki/Orders_of_magnitude_(acceleration)) leaves some elements to consider. For instance, protons in Fermilab accelerator (9E12 g) should be influenced by nearby objects larger than 8km, earth for example. Even half the horizon of earth should be big enough. Also experiments during sunset should yield strange results when the sun is aligned with the plane of the ring. Could this anomaly be easy to identify? tyy - why the hostility? Mike has a lot of papers on the topic, and quite a few of them have made it through peer review. His claims are largely based on empirical evidence and where he is extrapolating, it is explicit, but ultimately derived from the empirical evidence. coldsponger: Interesting study by Indranil and Zhao. There are now quite a few falsifications of dark matter around, most published in the past year or so. I'm actually in contact with Indranil in a more theoretical line: he has asked me how to model MiHsC in a many body problem. Gabriel: Interesting. I did mention an experiment with the CERN accelerator in this paper: https://arxiv.org/abs/1004.3303 You also have to consider relativity since those particles are going pretty fast and the Unruh waves shorten. Your suggestion of an effect at sunset is interesting because I have had similar thoughts regarding the controversial Allais effect. I wonder: is it caused by MiHsC when the accelerations within the Sun are blocked by the Moon? I can get the right numbers from MiHsC, but then there would also be an effect at sunset when the Sun goes behind the Earth and nothing like that has been seen. I apologize for this not being in regards to the current post. You put emphasis on testable theories and in that regard you mentioned a "warm version" of the spinning disk test. Are there any updates to the status of that test? Charles: I hope the experimentor won't mind me saying that it is still ongoing. The problem has been noise from vibrations. Used 2 Dyson motors 100k rpm..
Can the variation of the speed of light detected in Miller's experiment according to Allais (daytime sidereal variation of the speed of light over a period of 23 hours 56 minutes with a "aether wind" amplitude of 7.95 km/s) be explained by MiHsC/Horizon Mechanics? Julien: I will look into it. I never ignore potential new data. There is a weather physicist named David Pares out of Nebraska, who had a friend who was a pilot. This pilot got caught in a thunderstorm near Miami and flew through a sort of cloud vortex. Anyway, to make a long story short, the pilot appeared to have flown 100 miles much faster than he should have, and used less fuel to make the journey from Andros Island to Miami than he should have. In studying this phenomenon and examining the flight records, David Pares theorized that fields in the thunderstorm created either a "wormhole-like" effect or warp drive effect through a weather system that acts like a "tri-pole antenna." Pares has since taken to re-creating this tripole antenna in his garage to see if it can induce space-compression effects. He uses antennae in a fractal pattern. When I saw you mention the word "fractal" here in this post, it reminded me of that. Pares claims he has indeed created a small time-space compression near his antenna and now has a team of scientists working on his warp drive dymanics page. Have you heard of this guy? I wondered if what he is creating might be a horizon drive of sorts. He, too, receives much criticism from mainstream physicists. I confess I am just not yet up to the level of physics and mathematics to fully understand all the mechanics of what is going on both here and there (although I can intuitively grasp what a horizon is based on your writings.) What mathematics and physics would you suggest might get me up to speed so that I can develop ideas along this line? Tensors? Complex Analysis? Wave theory? I have been looking at online resources for studying maths and physics, particularly Youtube playlists teaching advanced calculus and so on. I've heard of this before. I'm impressed he is doing a lab experiment. It would be more controllable and believable that the aircraft incident, which is open to all kinds of uncertainty. I guess the crucial subjects to study, are those around the 'line of fracture' of theoretical physics: the ideas and maths of quantum mechanics (H.U.P), the ZPF of Einstein and Stern, the EPR paradox, Bell tests, Rindler horizons (relativistic maths) and Landauer's principle. Whole the horizon thing is artifact of your regressions of reality: the fact that magnitude of some phenomena can be estimated from the size of Universe doesn't imply, that it has origin on its boundary. BTW In which way your Quantized Inertia theory actually quantizes the inertia? Zephir: I'm not saying there is an 'origin' on the cosmic horizon. I'm not of the holographic persuasion. In QI there is a symbiosis, if you like, between local dynamics and the cosmic horizon. The data shows this clearly. QI says that some accelerations produce Unruh waves that resonate within the cosmic horizon (more inertia) and some do not (less). Inertial mass varies accordingly. This is just what I'm asking for - the resonance of waves manifest itself with multiple maxims (analogy of quantum numbers). Which local mechanisms the QI/MiHsC theory utilizes?